This scenic ride heads east from Yountville in Napa Valley to Lake Hennessey on Sage Canyon Rd/CA-128 E. It continues out to Lake Berryessa on Berryessa Knoxville Rd followed by a climb up Pope Canyon into Pope Valley. 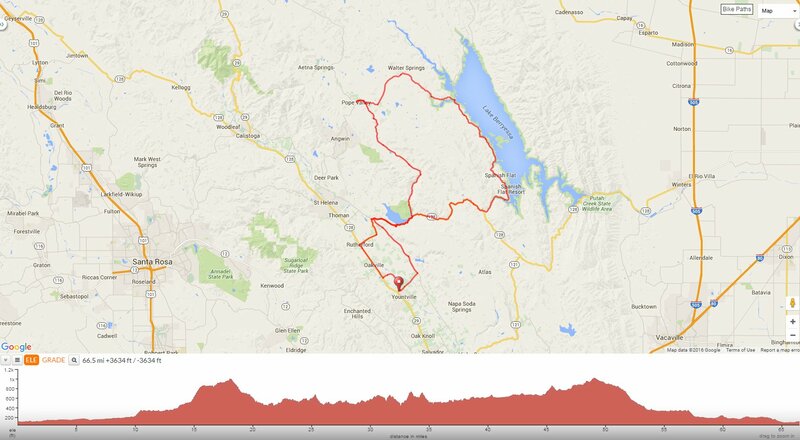 The return includes a fun rolling stretch on Chiles Pope Valley Rd followed by a grand sweeping descent along Chiles Creek back to Lake Hennessey. Head north on Hwy 29 along the estate wineries and vineyards around Napa Valley. Meet up at Lake Hennessey boat launch area. Turn right and head east on Sage Canyon Rd/CA-128; the rolling terrain for the first 2.4 miles goes along Sage Creek to the gates at Kuleto Estate Winery. The one short climb from Capell Cove up to the ridge has fabulous views of the lake and the surrounding mountains. Enjoy the views of Lake Berryessa and the distant ridges around Vaca Mountains! Continue on Berryessa Knoxville Rd for the next couple of miles to the Spanish Flat Country Store. The half-mile climb from Spanish Flat up to the Fire Station is followed by a rapid descent into Quarry Canyon. The road gently tilts back up to the Dufer Point Visitor Center at Lake Berryessa. Enter through the exit gate at the south end of Oak Shores main entrance to the Acorn Beach picnic area. Lunch at the Lake Berryessa Oak Shores-Acorn Beach Area. Enjoy the views of the lake! 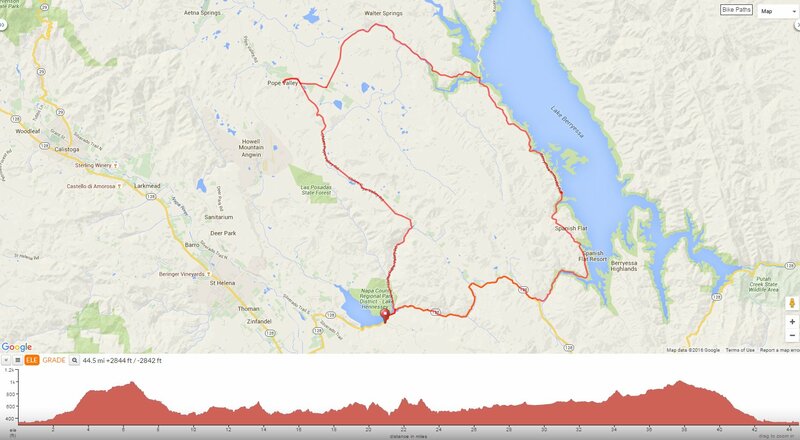 Continue north on Berryessa Knoxville Rd for the next 6 miles; the rolling climbs has gradient ranges of 5-9%. The bridge crossing over Lake Berryessa takes you onto Pope Canyon Rd with beautiful lake views! The remaining 6+ miles of rolling terrain through the desert like landscape surrounding Cedar Roughs leads out to the expansive Pope Valley. Cut through the valley vineyards on Pope Valley Cross Rd to Chiles Pope Valley Rd. The right turn on Chiles Pope Valley Rd leads into Pope Valley to the Pope Valley Market. Stop at Pope Valley Market. Head SE on Chiles Pope Valley Rd; the first couple of miles goes along the valley through a ranching community with views of the open meadows and hillside vineyards. The road kicks up for a 0.6-mile climb with 5-8% grades. The next 3.7 miles of flat rolling terrain takes you pass the many vineyards,ranches, olive groves and open grasslands. Chiles Pope Valley Rd leads back onto CA-128 W.
Return around Lake Hennessey on CA-128/Sage Canyon Rd to Silverado Trail. This is a wonderful ride through the picturesque Napa Valley along the country back roads to Lake Hennessey, Lake Berryessa and Pope Valley. You’ll enjoy the scenic lakes and the wide open valleys on the roads less-traveled. Weather: Partly cloudy, humid and warm. Temps ranged from the high 50’s to the low 70’s with brisk SW winds.